(CNN) -- She is living in a hydrangea-free world, and she is a hydrangea-free girl. That's right, hydrangea lovers -- it's no accident that Keith Carradine wins Madonna's heart with a bunch of daisies instead of your favorite flower in the "Material Girl" video. 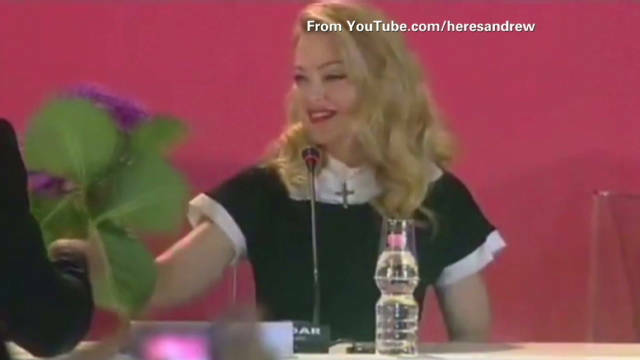 Madonna "absolutely loathes hydrangeas," she said after she was given a huge purple one at the Venice Film Festival -- apparently not realizing her microphone was live. She smiled thinly and thanked the fan who gave her the flower as she was promoting her movie "W.E." in Italy this week. But as she put it under the table, she told the person next to her she hates the flowers. "He obviously doesn't know that," she adds. A video of the remark has gone viral online, with more than 1 million views on YouTube already, and it's apparently not winning her new fans -- it's getting nearly twice as many "dislikes" as "likes." A Madonna rep defended the star's preferences. "She's entitled to like any flower she wants and she didn't want to hurt the feeling of the hydrangeas of the world," the rep said in a short statement. "No disrespect to the hydrangeas lovers of the world but she prefers different types of flowers."